It was built in two phases, in 1859-1863 and 1868-1885, based on studies of the Danish architect Theophile Hansen and it is believed to be his most exquisite work in Greece. Hansen himself was also supervising the construction up to 1861 when E. Ziller took over. 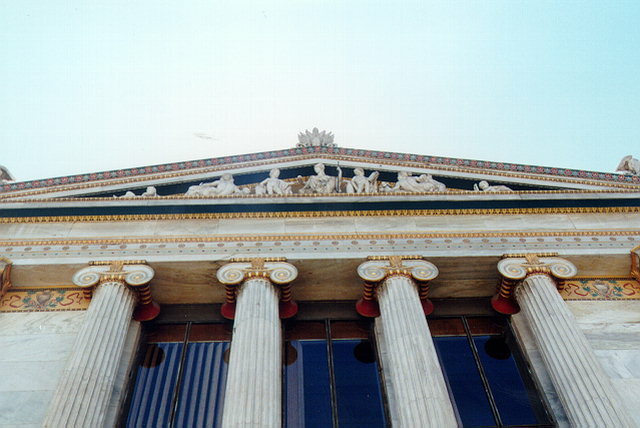 The embossed compositions on the central pediment and the statues outside are works of the sculptor L. Drosis. The embossed compositions on the eight small pediments are worked by Fr. Melnizki (1875) and the wall-paintings in the interior were made by K. Grupenckel.